This beacon transmitter can frequently be heard on 503.700kHz around the southern UK. 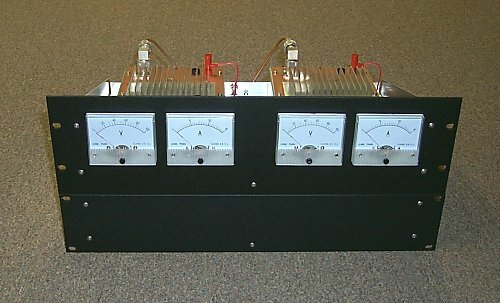 It generates a sequence of outputs in 3 different modes The RF electronics in the transmitter produces 6 Watts output but the antenna only radiates 2.5mW ERP. The output of a standard "can" Xtal oscillator at 5,068 kHz is fed to a 7490 divide-by-10 stage. The resulting 506.8 kHz square wave is fed directly to ½ of the 4427 driver, and also inverted by ¼ of the 7400 that feeds the other half of the 4427 (Q and not Q). This VXO transmitter was built fairly quickly once I had got my NOV for operation on 500kHz. It is largely based on the one I built for the UK 5MHz experimental allocation, in fact the VXO and PA are virtually identical. JUMA TX500 is a digitally controlled CW transmitter for the 500 kHz amateur radio band (600 m). The transmitter is available as a component kit which inludes all the electrical and mechanical components. Low-cost, high efficiency, simple repeatable design.